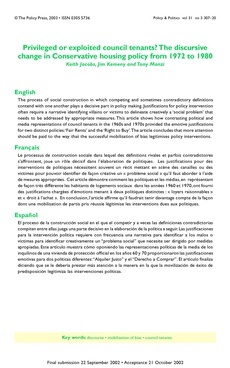 The process of social construction in which competing and sometimes contradictory definitions contend with one another plays a decisive part in policy making. Justifications for policy intervention often require a narrative identifying villains or victims to delineate creatively a 'social problem' that needs to be addressed by appropriate measures. This article shows how contrasting political and media representations of council tenants in the 1960s and 1970s provided the emotive justifications for two distinct policies: 'Fair Rents' and the 'Right to Buy'. The article concludes that more attention should be paid to the way that the successful mobilisation of bias legitimises policy interventions.